1. Log into ICON here. 2. Click on "Canvas Home"
4. Click on the “Log in” button in the top right-hand corner as seen below. Canvas should automatically log you in. NOTE: you may need to confirm your hawkid and password if this is your first time logging in. 5. Click on "Ideas." This is where you can vote and create new ideas. 1. Click on the "Open for voting" button in the lower middle of the screen. 2. 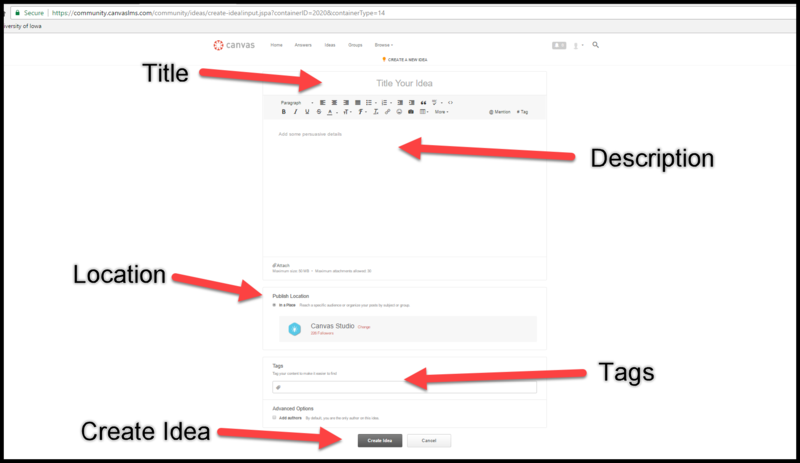 From here you can scroll through the most popular, or search for ideas you would like the Canvas team to develop. 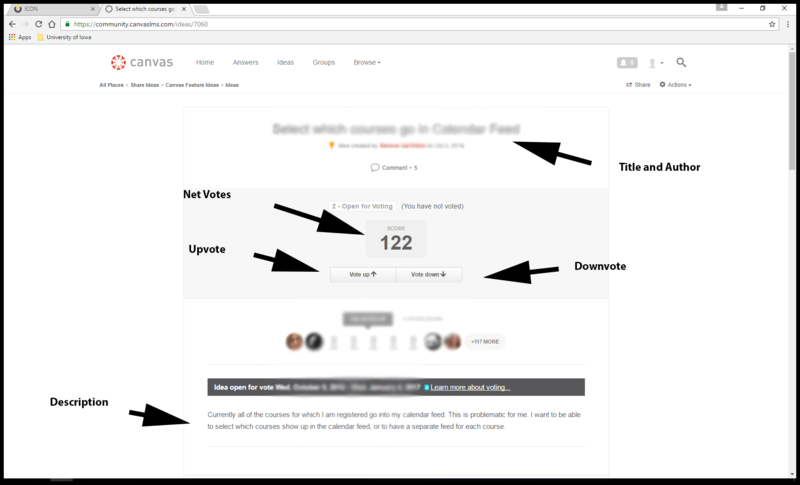 Once you have an idea you want to vote on, click on the idea's title. 3. From here, you will be able to read more about the idea and choose to up-vote or down-vote the idea with the buttons in the middle of the screen (as shown below). 1. Make sure you are at https://community.canvaslms.com/community/ideas. 2. Click on the Actions drop down menu in the top right corner of the screen, then select Idea. Ideas are selected to move on to the next development stage, Product Radar, based on their vote count, market group, view count, comments, or other factors. After six months, ideas go through an evaluation process. Ideas in the top 10th percentile will remain in general forum while the rest of ideas will be archived. If your idea does not hit the top 10th percentile of ideas in six months, it will be sent into their archive. You can then resubmit the idea as a new idea if it is still relevant to your needs. 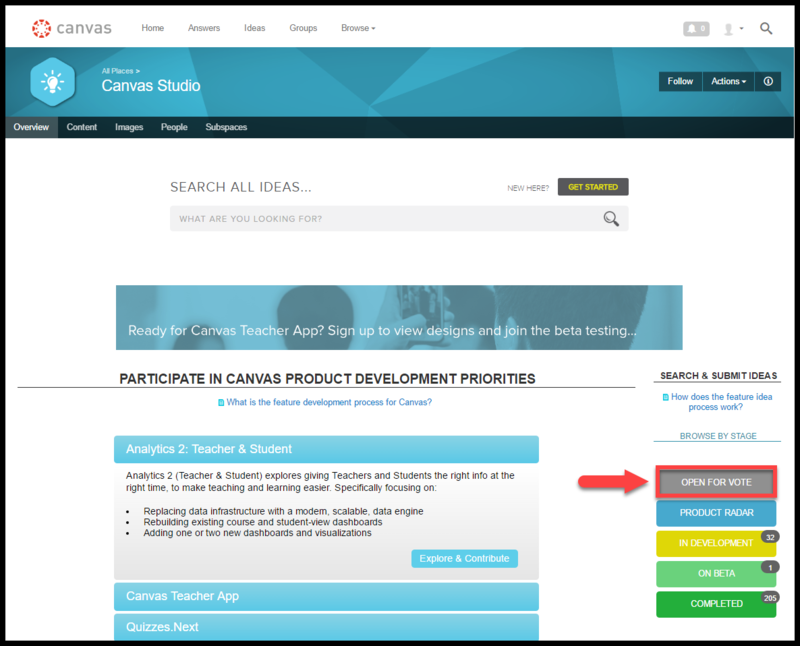 For more information on Canvas development processes click here.